Forgive me for coming back to this, but I just remembered a loose thread that I'd like to tie up. 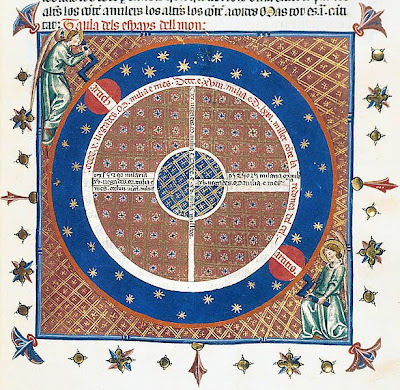 In part 2 of this series, I relied heavily on two books Measuring the Universe: Cosmic Dimensions from Aristarchus to Halley by Albert Van Helden, and The Discarded Image by C. S. Lewis. While these two books are generally in agreement, I stated that Van Helden disagreed with Lewis regarding Roger Bacon's Opus Maius. I didn't go into any detail about it because it's a minor point and this is really my only area of contention with Van Helden. 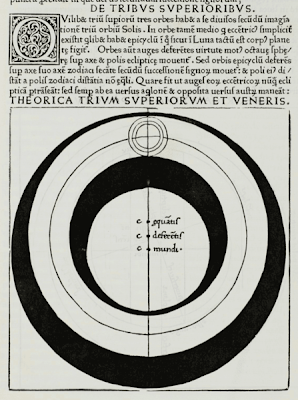 Van Helden uses this quote to claim that Lewis was "curiously uninformed" about the dimensions of the medieval model of the universe, and states, "Had Lewis actually looked at Roger Bacon's Opus Maius instead of using a secondary source, he would have found the Ptolemaic System in all its detail laid out before him" (Measuring the Universe, 28). There are a few points to make about this. First, to claim this one quote somehow demonstrates a general unfamiliarity with medieval cosmology on Lewis's part is simply unjustified. We would need more evidence, much more evidence, to warrant such a conclusion. Second, Lewis directly quoted Bacon only a few pages earlier (Discarded Image, 93), so he was obviously familiar with his writings firsthand. Third, the quote in question is only referring to the size of the stars, not to their distances; something made evident by the fact that immediately following the quote, Lewis clearly changes the subject to their distances, writing, "As to estimates of distance..."
With this, I am unable to see that Van Helden's criticism has any merit. Lewis's statement that "Roger Bacon in the thirteenth [century maintains] simply that the least star is 'bigger' than she [i.e. the Earth]", seems relatively innocuous. Perhaps Bacon wrote extensively about the size of the stars, and so Lewis should not have written the word "simply". However Van Helden does not cite any such estimations on Bacon's part, and I don't have a copy readily available to check. At any rate, Lewis's statement does not appear to be a significant misrepresentation. 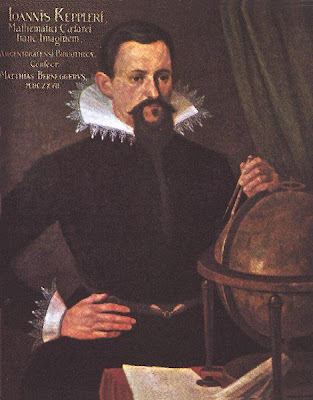 Bacon certainly affirms his main thesis when he writes that "the Earth does not possess any sensible size with respect to the heavens" (Opus Maius, 1:258), something Van Helden himself notes (Measuring the Universe, 36). But the reason why these thinkers held this opinion is that while they were inquiring into the truth of that which is, they thought, ‘that which is’ was identical with the sensible world; in this, however, there is largely present the nature of the indeterminate—of that which exists in the peculiar sense which we have explained; and therefore, while they speak plausibly, they do not say what is true (for it is fitting to put the matter so rather than as Epicharmus put it against Xenophanes). And again, because they saw that all this world of nature is in movement and that about that which changes no true statement can be made, they said that of course, regarding that which everywhere in every respect is changing, nothing could truly be affirmed. It was this belief that blossomed into the most extreme of the views above mentioned, that of the professed Heracliteans, such as was held by Cratylus, who finally did not think it right to say anything but only moved his finger, and criticized Heraclitus for saying that it is impossible to step twice into the same river; for he thought one could not do it even once. I think if Cratylus, in a fit of inconsistency, tried to write down the philosophy that led him to forsake communication, it would be something very close to Nietzsche’s. The acumen of Nietzsche’s parable with which he begins his essay ‘On Truth and Lies in a Nonmoral Sense’ rests in its definition of humanity as ‘clever beasts [which] invented knowing.’ One might first think that Nietzsche is stating that the clever beasts tricked themselves into thinking they knew something when they really did not; that their ‘knowledge’ about reality was incorrect. But this is not the case. Knowledge refers to some kind of objective information; even if it is information about the subject, it is about the subject qua object. If man’s ‘knowledge’ is false, it would imply that there might be correct knowledge, ‘truth,’ to be had, even if merely theoretic truth. But there is no such information. This does not mean that Nietzsche is a solipsist, but that what does exist is so radically different and discontinuous with man, that there is no way for him to ever come into contact with it. By saying that humanity invented knowing, Nietzsche is saying that there is no such thing as knowledge; that the dichotomy of true and false is illusory. The beliefs that plague humanity exactly parallel those that any other animal has: they have no corresponding object, and only reveal something about those who hold them. The reason Nietzsche’s point is particularly brilliant is that he is taking Kant’s claim that man cannot know the noumena, the thing in itself, and then takes a step further back by applying this to the concept of knowledge itself. While claiming that man cannot know the object qua object does not necessarily mean that there is no object, when man looks for knowledge qua knowledge, the whole epistemological pursuit necessarily self-destructs, since it is by knowledge that he seeks it. Since he cannot know knowledge qua knowledge, Nietzsche necessarily concludes that there is no such thing. Nietzsche then goes on to wonder how this belief in knowledge could have arisen from the intellect, an evolutionary adaptation, the only purpose of which is to help the individual survive and produce progeny. The answer is that the individual protects himself from others and the world by means of deception, since he does not have the capacity to do so by physical means. However it is not merely the deception of others, but his own deception as well. His dreams deceive him, but he does not object. He tricks himself into thinking he knows about the external world, when there is not anything to know. He thinks he knows himself, while nature is preventing him from having even the most rudimentary knowledge thereof. One major point Nietzsche makes here is that man only employs his senses (which, themselves, are entirely untrustworthy) superficially to try to understand reality. Such exercises are only a ‘groping game on the backs of things,’ and man’s ‘eyes merely glide over the surface of things and see "forms. "’ This is the beginning of Nietzsche’s direct assault on Plato’s doctrine that the sensible world is merely a shadow of the world of forms or ideas. Humankind has immersed itself in deception—man can never know things as they are, because there is nothing to know, so he only superficially looks at the information presented to him by his senses, and then tricks himself into believing that he has encountered reality; and in so doing, becomes completely enamored with his own excellence. This gives rise to a very important conundrum: humanity finds itself in a state of constant deception and dissimulation. But given this state, how could man have a genuine desire for truth? Nietzsche’s answer is that humanity does not merely want survival, but fellowship with each other. Man is a social animal. 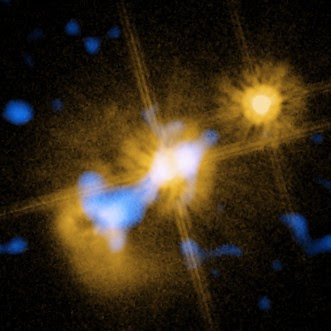 Therefore, as Hobbes declared in Leviathan, the individual must make a kind of peace treaty with others in exchange for such fellowship—and such a treaty necessarily involves the establishing of ‘uniformly valid and binding designation(s),’ in order to achieve some kind of rapport with each other. Hence, the ‘truth’ is now what the herd has established, and the ‘liar’ is one who uses these appellations contrarily to their designations. However, this is only a first step towards the desire for truth. Nietzsche shrewdly points out that one who behaves as a ‘liar’ will be excluded from the herd—not for lying, but for causing harm by means of lying. The point being that it is not the deception itself that is offensive, just the consequences. Similarly, man wants the truth as long as it is comfortable and safe, but if it is inconsequential or harmful he is apathetic or hostile towards it. This is precisely where Nietzsche’s view of the nature of language comes in: he argues that language must have subjective reference in order for it to have any meaning to man. The phrase ‘the stone is hard,’ does not say anything about the stone itself, but about man’s subjective experience of the stone, since ‘hard’ does not refer to something in the external world, but to man’s encounter with an object. Here, Nietzsche seems to be saying that if language had no subjective reference, it would not make sense to man as subject, because it would not have any connection to him; but insofar as language has a subjective reference, it cannot be considered to be describing objective reality, and hence, cannot be considered to be truth. Truth would be for language to describe the noumena, the ‘thing in itself.’ But this is simply impossible. Man can only describe things as they come into contact with him, and the consequent relationship determines his understanding thereupon. Language does not describe things: it describes man’s relationship with and perception of things. Nietzsche goes on to further remove language from objective reality, by arguing that it is even discontinuous with man’s perception itself. He points out the fact that most, if not all, words are totally arbitrary designations. Even in the case where they are not, they simply take their cue from another designation, and this process itself is entirely arbitrary. Many languages assign gender to objects, but it is difficult to see this as reflecting any objective reality. The fact that there are different languages makes this point evident. Nietzsche is once again arguing against Platonism here, particularly the position Plato takes in Cratylus. The only way to avoid this is through rigid application of the laws of logic, which Nietzsche dismisses as ‘tautologies’ and ‘empty husks’; that is, these laws do not reveal anything that is not already contained within the concept. He further illustrates this by pointing out that the spoken word is merely ‘the copy in sound of a nerve stimulus,’ and any inference to an external cause is an invalid application of the principle of sufficient reason (contra Schopenhauer, whom he more often agrees with). He states that there are two unjustifiable inferences made in the process of language: first, a nerve stimulus is translated into an image; second, the image is translated into a sound. But there can be no connection between these three spheres. To ‘translate’ a nerve stimulus into an image, or an image into a sound, means to make one thing into something entirely different and other than what it is. He illustrates this by asking if someone who is deaf can understand the experience of hearing when sound is ‘translated’ into touch (vibrations) or sight. The obvious answer is: no. When translated thus, it ceases to be sound. Similarly, when man translates an image into a sound, it ceases to be an image, and consequently has no relationship to the image. Thus, Nietzsche calls these translations ‘metaphors’ and ‘illusions,’ and elsewhere in this essay, he refers to them as ‘lies.’ The word-symbol used to designate an object has no logical relation with the thing in itself, not being derived from its essence; and hence, everything the scientist and philosopher build on the content of language, i.e., concepts, is straw. Nietzsche thus broadens his assault to include concepts themselves. He argues that conceptualizing necessarily involves classification: making the commonalities shared between individual entities preeminent and definitive, while disregarding the differences as trivial. But, Nietzsche points out, the differences are the only thing man actually experiences. He does not encounter ‘the’ leaf, he encounters countless individual leaves, not one being exactly the same as another. He then disregards all the unique properties of all of these experiences, and classifies them according to their commonalities. But, in this process, man has done two things: first, he has equated things which are not equal. He has chosen to ignore those aspects which made them unique, which simply means that he has made them what they are not. He sees two leaves, and calls them such; but in so doing, he has taken two things which are not the same and claimed that they are. Second, he has created a concept that does not resemble any particular example of which it is supposed to be the archetype. Once again, he is arguing against Plato’s doctrine of the Forms. He uses this to not only mock Plato, but ‘Platonism for the masses,’ by suggesting that if all of the individual leaves are copied from an original, it would imply that the ‘counterfeiter’ is incompetent, since none of them are accurate representations. While the example of the leaf is perfectly in line with Plato’s philosophy, it is not the most evident example. When an individual sees a leaf, he does not tend to instinctively infer a larger reality of which it is merely a representation. Thus, in order to attack Plato head on, Nietzsche further illustrates his critique with a clearer example: honesty. This is a more lucid example than the leaf because when man encounters someone behaving honestly, he tends to see this as representative of something about that individual; that is, he believes the particular act of honesty he witnesses is a manifestation of a larger reality, namely, a character trait. But, Nietzsche says, this is precisely the lie that man tells himself. He has individual encounters of people behaving honestly, none of which are the same, and then invents a trait called ‘honesty’ which he then claims is not only the commonality between these encounters, but is actually the cause of this behavior in the first place. He has invented an unseen and obscure property, and claimed that it is the reality, instead of the actual experience. Nietzsche even applies this to the distinction between individual and species, that is, the difference between experience and the categories under which man classifies them. However, he quickly qualifies this: to say this distinction is not part of the world itself would be just as dogmatic as saying in fact that it is. This, I think, shows the primary weakness in his argument: his claim is that our concepts (the species) do not reflect the real world at all, and the linchpin is that by inferring the species via the observation of the individual, man leaves behind his actual observations for a hidden concept. But Nietzsche recognizes that he would be contradicting himself to say that the distinction between species and individual itself actually reflects the essence of the way things are: not only because he has already argued that man cannot approach the way things really are, but because this distinction is itself a concept. Thus, he finds himself, for consistency’s sake, having to point out that this distinction cannot be said to represent reality. But since his whole argument depends on this distinction—that by focusing on the species, man misses the individual, and exchanges his experience for an imaginary world—he also points out that it cannot be said to not do so. However, to make this point at this juncture is arbitrary, since the same thing could have been said of any step in the argument. This inconsistency parallels how Nietzsche’s denial of metaphysics led him to affirm the doctrine of the eternal return—which is itself profoundly metaphysical. Truth, therefore, is ‘a sum of human relations, … illusions which we have forgotten are illusions … the duty to lie according to a fixed convention.’ But, this still does not explain how man could ever desire ‘truth’ in sincerity. In order to do so, Nietzsche must couple what has been said thus far with what is, essentially, a case of collective amnesia. Man has grown so accustomed to this scenario, that he participates therein unconsciously. A subjective standpoint is established in order for people to coexist, and it is soon mistakenly thought to represent an objective standpoint. This is precisely how these clever beasts obtain a drive for ‘truth’: man feels morally obligated to acknowledge the traditional arbitrary designations. But, as has already been noted, these designations are removed from the individual and unique experiences that the individual has actually had. Hence, he governs his life according to abstractions, rather than experiences. He is supposed to let these abstractions guide him, rather than be ‘carried away’ by sudden impressions—that is, actual experiences—and thinks, in so doing, that he is being ‘rational.’ This is the first step toward the creation of an entirely different world than the one in which man really lives, a project that is distinctively human. Man is trying to impose an order on the world that does not exist in order to make it easier for him to endure. He does not realize that he is just using the agreed-upon symbols in order to avoid exclusion from the herd. Now that man has these abstractions, Nietzsche says, he can arrange them into whatever order he wants; subordinating one to another or vice versa. He can then use this invented schematization to create laws and systems and castes to further itself, and further remove himself from his actual experiences. In fact make itself seem ‘more solid, more universal, better known, and more human’ than the latter, or in other words, make itself seem more real. But of course, this is a complete illusion; it is a ‘crap game.’ Nevertheless, Nietzsche points out, it is a particularly brilliant maneuver: men are geniuses of construction who have built ‘an infinitely complicated dome of concepts upon an unstable foundation, and, as it were, on running water.’ Such construction requires great ingenuity. It is like a spider’s web in that its parts are simultaneously malleable and strong. And yet, the spider builds his web out of given material; the bee builds his hive with that which he collects from nature. Man, however, does not merely construct his edifice, but actually invents the material he uses in the construction itself. However, Nietzsche takes away with one hand what he has offered with the other. The ‘material’ with which man constructs his tower of Babel is simply the result of anthropomorphic thinking, which, of course, has nothing to do with reality. Concepts have no reference beyond man, they are merely the ‘residue of a metaphor.’ Man is classifying and constructing a world out of human interests. He is trying to make the world seem more like himself, because he has a powerful need to feel as if he belongs in it. He wants to be a part of the world, so it would only seem reasonable that he can apply the terms of his own existence thereupon. Man sees the universe either as a person par excellence, or as having such a person behind it. This leads to an interesting twist: the traditionalists, with their attempts to know objective reality as it is in itself, independent of themselves, are the ones who have made man the measure of all things. But they err in that they have mistaken their experience with actual objects, with things in themselves, and have forgotten that they are merely metaphors. Thus far, Nietzsche has engaged in criticism or deconstruction. At this point, he begins to propound his own view of these matters. Man’s forgetfulness that the world is a metaphor is the forgetfulness that he is the one who created the metaphor in the first place. The fact that man has crafted the world as an artist according to his instincts of survival and community implies that he can craft it according to more appropriate ends: he must take into account aesthetics. This is a point which forms the basis for much of Nietzche’s later philosophy. Man is to create the world he wants, while holding before his mind all the while that it is his creation. As soon as he forgets this, he has slipped back into the lie of believing that his creations actually correspond to things in themselves, and hence, are true. The Übermensch is the one who can accept this scenario, and thus live life on its own terms. After the lion destroys the world that has been deeded to him, he is free to metamorphosize into the child who simply plays, by creating and then destroying for no external purpose. It does not take anything into account other than aesthetics. By contrast, the man who is unable to accept this scenario is the philosopher who has effected his own survival ‘only by means of the petrification and coagulation of a mass of images which originally streamed from the primal faculty of human imagination like a fiery liquid.’ This was not done primarily for aesthetic purposes, but in order to survive and commune with others. He refuses to live life on its own terms, and instead tries to tame it. Precisely by creating the world of concepts in order to sustain his own life, he denies life. The phraseology in Nietzsche’s quote above illustrates the contempt he has for this process, a contempt which is further demonstrated by his referring to this process as the ‘dissolv[ing of] an image into a concept’ which itself is ‘less colorful’ and ‘cooler’ than that of which it is supposedly the archetype. However, this is not meant to imply that Nietzsche does not understand how this situation came about. It is the desire to live with ‘repose, security, and consistency.’ To deny the world of concepts requires one to not only give up all security and constancy, but to destroy their self-consciousness. Nietzsche then builds on a claim he made at the beginning of his essay: since all animals perceive that the universe revolves around them, perceptions only reveal something about the one who experiences them, and thus, these perceptions have no corresponding object. Even if humankind had the strength to admit this fact, it would only lead man to ask which animal has the correct perspective. Nietzsche destroys this from both sides: first of all, in order to determine the correct perspective, one would have to have some kind of independent perspective by which he could judge them all. But this is unintelligible. How can one have a perspective independent of perspectives? Such a vantage point is simply unavailable. Thus, when man tries to move from himself to the world, he fails. Second, when he tries to move from the world to himself, he fails again, since these are two different universes. The world is an entirely different realm than man, and between the two no information can flow. It is not that humankind has not yet discovered a way to move from one to the other, but that such movement is nonsensical. The question Nietzsche has been implicitly asking throughout this essay is, what would it mean to know the thing in itself, apart from experience? This question makes no sense. In order for man to know something, he has to experience it. Knowledge presupposes experience. It is basically asking, what would the experience of something which man does not (and cannot) experience be like? The only way for man to have ‘knowledge’ is by experiencing something—and this means that such knowledge is not of the thing itself, but of man’s experience of and relationship with it. Since man’s knowledge is based on his subjectivity, it cannot be said to have anything in common with the object he is supposedly encountering. ‘Truth’ would be knowledge of the noumena, the thing in itself, knowing it in its objectivity. But this is simply a contradiction in terms. There is no causal link between these two domains. One cannot express itself in the other. Where does this leave man? There is still ‘a suggestive transference, a stammering translation into a completely foreign tongue—for which there is required, in any case, a freely inventive intermediate sphere and mediating force.’ There is, in other words, an aesthetic relationship between these two spheres. ‘Aesthetic’ because it involves free invention or creation, which is precisely the role Nietzsche sees for the superman: the ability to live life on its own terms. Man creates his own sphere and forces it to mediate between himself and the world. However, it would be a mistake to think that this mediation actually enables him to make contact with the world. Man has created this sphere; it is not an invention, it is a work of art, the purpose of which is to please, not to accomplish an external goal. The lie is that man has forgotten this is the way things stand with him. He has spent so much time looking at the same work of art, that it has hardened and congealed in place. The lie has been repeated so often that it has the same status as if it actually established a causal relation between ourselves and the world. Man has mistaken his creation for something it is not, in much the same way that a dream can be mistaken for reality. At this point, Nietzsche changes his focus to another audience. He recognizes that the last step before one achieves his philosophy is the positivism which the natural sciences promulgate. So he addresses those who hold this view, by broadening his assault to include the scientist as well as the philosopher. 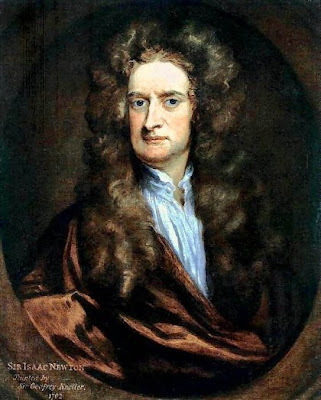 He begins by stating that those who are familiar with the objections he has made thus far obviously reject any sort of idealism, and instead embrace what they perhaps consider to be the only alternative: ‘the eternal consistency, omnipresence, and infallibility of the laws of nature.’ This is the view that science (or, perhaps, ‘Science’) will continue excavating a reality which is completely consistent with itself, and shows forth no hint of the anthropomorphic thinking Nietzsche has thus far condemned. Such faith is reasonable, for, unlike idealism, it is strikingly discontinuous with man’s imagination, and therefore is unlikely to be a product thereof. Obviously, man does not experience nature in such a way; he experiences it in ways common to all, and this is precisely what allows humankind to be communal animals. But the positivist has mistaken these common paths of experience with reality itself, instead of recognizing it as just a part of humanity’s collective makeup. These paths allow him to unify that which is divergent. All of these laws are based on the imposition of mathematical precision on the world via the representations of time and space. But, as Kant pointed out a century earlier, time and space are simply the nets which man cannot help but throw over the world in order to comprehend it. Man is unable to understand anything divorced from these media, so it is not particular impressive that he perceives everything in accordance with them. 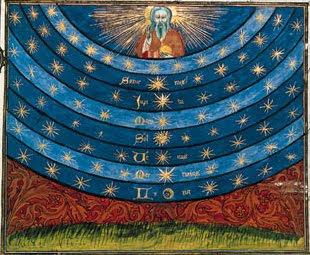 ‘All that conformity to law, which impresses us so much in the movement of the stars and in chemical process, coincides at bottom with those properties which we bring to things.’ Through science, man tries to investigate the world mathematically; but the concept of number is not something in the world, but is merely in man’s experience. Thus, man’s amazement with the laws and regularity of nature is simply amazement with himself. The edifice of concepts is only made possible because of the edifice already constructed ‘by the firm persistence of these original forms.’ Idealism, in other words, is an imitation of positivism, in that it copies the latter’s use of metaphors (in this case, time, space, and number) in order to construct a world. However, in another sense, it is positivism which copies idealism, since it is simply ‘filling in’ the cells of the great edifice composed of concepts, just as the bee fills the cells of his hive with honey. To be sure, it does not accept this edifice on its own terms. It certainly renovates. But to renovate a building is not to create a new one in its place. The positivist/scientist thus modifies the structure, remodels the schematization, and reforms the caste system, in order to bring it up to code; that is, in order to bring it into agreement with the empirical—the anthropomorphic—world. The scientist works with concepts, derived from language, just as the philosopher does. Both seek to remove themselves from life by constructing a shelter from the continuous hail of powers that oppose the ‘truth’ they have created. Thus far, Nietzsche has explicated the human condition, and scorned those who would seek to escape it. Rather, humankind should embrace the creative nature of life, and live in consonance with it. In the past man has created metaphors and mistaken them for reality. The solution is not and cannot be to stop creating such metaphors, since this is the ‘fundamental human drive.’ The tyranny of concepts, which has forbidden man from creating new metaphors, does not in any way lessen this drive. Man must instead find a new way to express this drive, and this is done, Nietzsche says, in myth and art. The reason these channels are better suited to the formation of metaphors than concepts, is because they have no pretense to constancy. Instead of capturing experiences and subordinating them under abstract rubrics—where they sit and grow stale, tasteless, and tepid—myth and art focus on the exhilaration, the color, the sharpness of the experiences themselves; and as soon as the focus begins to dull and the colors become less bright, they immediately change the view. There are, essentially, two conflicting and irreconcilable drives waging battle within man. One is to create, to accept life as it comes and glory in it. The other is to effect one’s own safety, to run away from life; or at the very least, tame it so that it can no longer cause harm. The bravery of the former contrasts with the cowardice of the latter, which is based on the fear of misfortune, and seeks to minimize the experience thereof. To this end, it dulls life, by denying experience and upholding concepts as ‘reality.’ Of course, the same medium which makes possible this experience of misfortune which the philosopher and scientist so desperately seek to avoid, also makes possible the experience of overwhelming elation. ‘The man who is guided by concepts and abstractions only succeeds by such means in warding off misfortune, without ever gaining any happiness for himself from these abstractions.’ Man cannot cancel out one without simultaneously canceling out the other. By neutralizing misfortune, he has neutralized elation, and neutered life. The fear of misfortune holds the pursuit of elation hostage. Both also seek to avoid misfortune, but again, by different means. The intuitive man ‘reaps from his intuition a harvest of continually inflowing illumination, cheer, and redemption’; in other words, he seeks to avoid misfortune positively, by pursuing elation. Of course, this means that he experiences misfortune more often, and that when he does, it is more intense, since he lacks any method for avoiding or minimizing it. ‘He does not understand how to learn from experience and keeps falling over and over again into the same ditch. He is then just as irrational in sorrow as he is in happiness: he cries aloud and will not be consoled.’ The rational man, on the other hand, seeks to avoid misfortune negatively, by running away from it. Instead of a human face, subject to the distortions which misfortune wreaks, he wears a mask, unaffected by circumstances. Thus, both employ deception. However, the intuitive man does so in his elation, the rational man in his misfortune. Nietzsche’s example of this is how the German word Schlange (snake) is derived from the verb schlingen (to wind or twist), a connection which could have been made to many other things, and which only arbitrarily selects one aspect of the object in question. I have to believe that Nietzsche would fully appreciate the double entendre this phrase captures in modern English. ‘Of the Three Metamorphoses’, in Thus Spoke Zarathustra. ‘How the "True World" Finally Became a Fable’, in Twilight of the Idols.